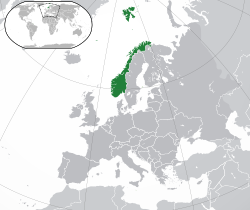 Norway is a country in the north of Europe. It is the western part of the Scandinavian peninsula. The mainland of Norway is surrounded by a coast on the west side and borders Russia, Finland, and Sweden to the east. The coast touches the Oslofjord, Skagerrak, and the North Sea. The Monarchy of Norway has been independent since 1814. Its head of state is a king - Harald the 5th (as of 2017). The national day is May 17, which celebrates Norway's constitution of 1814. The parliament is called Stortinget and its members are elected by the people every 4 years. About 5 million people live in Norway. The capital is the city of Oslo. Norwegian is the national language. There are two official written versions of Norwegian called Bokmål and Nynorsk. The Northern Sami language is spoken by around 90% of those who speak one of Norway's 3 Sami languages. Northern Sami is also an official language in a number of municipalities. The battle of Hafrsfjord (872 A.D.) resulted in small kingdoms becoming one larger kingdom, ruled by Harald Fairhair. After the king's death, again there were smaller kingdoms, inside Norway. Stockfish (or fish that has been freeze-dried, outside in cold weather) has been traded and exported; this happened as early as either the 9th century, 10th century, or 11th century until 1066. Other sources say that the exporting was happening as early as the 12th century; stockfish is one of the country's oldest [type of] things to be sold for export. In 1349 half of the Norwegian people died, getting sick from the bubonic plague (or Black Death). When a Norwegian king died in 1387, there was no Norwegian king until the 20th century. In 1397, Denmark, Norway and Sweden began the Kalmar Union. The first [known] map, where Norway is drawn, was made in 1482. The Norwegian constitution was written in 1814 and signed on 17th May that year. However, Denmark, on the losing side of the Napoleon wars, lost Norway to Sweden, on the winning side. A Swedish–Norwegian War started on 26 July 1814. It ended on 14 August, because of an agreement, called the Convention of Moss. The union with Sweden: It started on 14 August 1814, when the Convention of Moss (en) was signed; the union went on for 90 years. The results of the election in 1882, led to parlamentarism becoming part of Norway's political system; the votes of the "swamp men" decided the outcome of the election; they included teachers, artists and craftsmen who were not poor but also did not own land; ownership of land or a contract to use land was necessary to get voting rights; the "swamp men" had bough cheap land which was nearly useless, except for getting a right to vote. The right to vote in [ national and local ] elections, was given to the public (or the general public) in 1898. The end of the Union of Sweden and Norway, was on 7 June 1905, when Norway got its independence. In 1905 Prince Carl of Denmark was elected King of Norway. His name as a king, was King Haakon VII. In World War I, Norway was neutral and served as a trading nation. Norway tried to stay neutral in World War II, but was occupied by German forces from 9 April 1940 to 8 May 1945. Norway became a member of NATO. Oil was found in Norway's part of the North Sea, during the 1960s; the oil was found under the sea floor. King Haakon VII was already married, before he came to Norway (in 1905). His wife, Princess Maud, became Queen Maud. Their son, Prince Alexander of Denmark, became Crown Prince Olav and followed after his father as King Olav V in 1957. Olav and his wife, Crown Princess Märtha, had three children; Princess Ragnhild, Princess Astrid and Prince Harald (later Crown Prince Harald and in 1991 he followed his father as King Harald V). King Harald is the first king born in Norway in over 600 years. He has two children; Princess Märtha Louise and Crown Prince Haakon Magnus. The Government has Norwegian soldiers working in Syria (as of 2017) and Afghanistan, together with soldiers from other countries that belong to NATO. Exports include : natural gas, oil, hydroelectric power, and fish. Other natural resources are agriculture, forests, and minerals. The government collects much money from various sources, and has policies intended to spread this wealth among Norwegians. This spread of wealth, is done both directly and indirectly. Most people in Norway are ethnic Norwegians. They speak a language that is related to German and English. Swedish and Danish are so close to Norwegian that most Norwegians understand them. Across Norway, many different dialects are spoken. Norwegians disagree on how to make one correct written language. Therefore, there are two standard languages, Bokmål and Nynorsk. Nynorsk is used in writing in most of the western areas and in the central mountains. Bokmål is written by most people in the rest of the country. A native population of Norway, the Sami people, has its home in the northern parts of the country. Their language is not at all related to Norwegian. In some parishes in the far north, they make up the majority of people. Many Sami now live outside the Sami homeland, mostly in Oslo and other big cities. Earlier, Sami people were forced to speak Norwegian in school. Now Sami is taught as the first language in school for Sami children, and Norwegian is the first foreign language. Many immigrants have come to Norway in the last 30–40 years. They mostly live in and around Oslo, and in the other big cities. Many immigrants come from nearby countries, like Sweden, Denmark, Germany, Poland and Russia. There are also many from countries far away, such as Pakistan, Somalia, Iraq and Vietnam. Traditionally, all Norwegians were Lutherans, a variety of the Protestant faith. Still, more than 80% of Norwegians are Lutherans. Other important faiths include Islam, other Protestant groups and Catholicism. Among tourists to Norway, more come from Germany than from any other country. There are also many Swedes, Danes, British, Dutch and Italians visiting Norway. The Swedes and Danes often come in winter to go skiing. The others mainly come in summer. Many people visit Norway to see the Northern Lights, also known as the 'Aurora Borealis'. The largest national newspapers in Norway are Verdens Gang (VG), Aftenposten and Dagbladet. Norwegian culture can be compared to English culture in the way that it is considered a bad thing to show off, as opposed to the US, where this is more acceptable. This is a big aspect of Norwegian culture, and it is related to the philosophy of egalitarianism. Because of this, people will understate things, for example if a Norwegian says something is good or nice, it can mean that it's really great. Items from the Viking Age (in Norway), are shown in museums: One item is the Gokstad ship. Museums in Norway includes The Ibsen Museum - named after Henrik Ibsen. The farmers' culture (bondekulturen) was brutal. Unwanted babies were "placed in the forest" (sette barn på skogen) to die, until the nineteenth century; in the end, the [rural] police authority - consisting of individuals called lensmann (en) - were able to control [and stop] these crimes. In Norway power is shared among three branches: The justice sector, the government and the parliament (Stortinget). Norway also has a king, Harald V, but he does not have any real power and acts as a symbol and ambassador. This form of government is called a constitutional monarchy. Elections are held every four years, and the winner of the election is the party or coalition of parties that gets the most votes and seats in the parliament. After the elections are done, the winners work together to find out who the prime minister should be, as well as who the other ministers should be. Red (Rødt): A revolutionary socialist party which works for equality of income, labour rights, a controlled economy and feminism. Red is the only party on this list that is not in the Norwegian parliament. Socialist Left Party (Sosialistisk venstreparti): The party is not very radical and is concerned with environmental issues as well as education. The party is traditionally regarded as the "teacher's party" because of their focus on learning and school. One might call SV more of a social democratic party than a socialist party, since their socialist views have faded over the years. They were more radical in the 1970s and 80s. Norwegian Labour Party (Arbeiderpartiet): The Labour Party is the biggest party in Norway. They work for a strong economy with many regulations on private businesses, and are traditionally the party for workers, securing labour rights and the welfare state. Centre Party (Senterpartiet): The Centre Party used to be known as the farmer's party; they no longer use this name, but still they are mostly popular in the countryside and other rural regions, since they work for the environment and protection of Norwegian farmers. For example, raising tariffs, or putting taxes on imports, to make foreign food cost more so that people will buy from Norwegian farmers. This is called protectionism. Green Party (Miljøpartiet de Grønne): The Green party works for the environment only, and has recently been gaining a lot of popularity for its radical politics. They are mostly a left-side party, but will switch sides if it helps the environment. Liberal Party (Venstre): Even though it is called Left in English, it is actually a social liberal party that belongs to the centre-right side of Norwegian politics. They work for liberal rights like freedom of speech, gender equality and they are also concerned with environment. Because of this they heavily support public transport. Kristelig Folkeparti: The Christian People's Party is at present more active in local than national politics. Conservative Party (Høgre): The flagship of the right side of politics, it is a conservative party and is the second biggest party in Norway. It works for a free market, liberal rights and equality of opportunity. They are friendly towards private businesses and support economic growth by making taxes smaller, so that more people can start businesses. Progress Party (Fremskrittspartiet): The Progress Party is a right-side party. It works for stronger immigration laws, a free market and tough penalties for crimes. They also support private schools and flat taxes. The Conservative Party and the Progress Party are currently working together in a coalition government, after getting elected in the 2013 elections. It's also a minority government, so it has to work together with the other parties in the parliament to make change. The city with the most people living there (or inhabitants) is Oslo. The city of Bergen has 251,000 people living there; the city of Trondheim has 172,000 people in its population. Some claim that Bergen and Trondheim, each had their time, as Norway's capital during the Middle Ages. NATO : Norway was a founding member. ↑ "CIA – The World Factbook". Cia.gov. Retrieved 2011-07-23. ↑ "Arealstatistics for Norway 2019". Kartverket, mapping directory for Norway. 2019. Retrieved 2019-03-20. ↑ 5.0 5.1 5.2 5.3 "Norway". International Monetary Fund. Retrieved 2011-05-06. ↑ "Human Development Report 2011" (PDF). United Nations. 2011. Retrieved 25 November 2011. ↑ Herven, Marit (2009-05-16). ""Ja, vi elsker" 150 år". Norsk rikskringkasting (in Norwegian). NRK. Retrieved 2009-05-22. ↑ Duolljá, Svenn-Egil Knutsen (26 November 2018). "nordsamisk" – via Store norske leksikon. ↑ https://www.nrk.no/nordland/torrfisk-sensasjon_-_-vikinghistorien-ma-skrives-om-1.13632492 "I den islandske ættesagaen Egilssoga fra 1200-tallet står det om Torulv Kveldulvsson, en høvding i Hålogaland. Kveldulvsson drev, ifølge sagaen, næringsvirksomhet i stor stil, blant annet eksporterte han fisk til England rundt 875. Dette har frem til i dag bare vært ubekreftede fortellinger. Nå har forskerne altså klart å finne bevis som støtter opp for mistankene om at handelen med tørrfisk kan ha startet så tidlig som sagaene forteller om." ↑ "- Nå kommer denne nasjonalskatten hjem til Norge". Dagbladet.no. 28 August 2017. ↑ author. "Fikk verdifulle kart i gave". www.klartale.no. ↑ "Denmark". World Statesmen. Retrieved January 18, 2015. ↑ "Norway". World Statesmen. Retrieved January 18, 2015. ↑ Sejersted, Francis (8 January 2018). "Mossekonvensjonen" – via Store norske leksikon. ↑ "En liten myrflekk til fem kr ga deg stemmerett, og det ble avgjørende i 1882". www.dagsavisen.no. ↑ Mardal, Magnus A. (12 June 2017). "myrmenn" – via Store norske leksikon. ↑ "Norge i Syria". Klassekampen. ↑ "Forside - Ibsenmuseet". ibsenmuseet.no. ↑ 23.0 23.1 "Myter og unÃ¸yaktigheter". www.vl.no. ↑ dead link "Trondheim - the official website". Retrieved 2009-09-04. This page was last changed on 22 April 2019, at 12:22.